Ra’s al Khaymah, United Arab Emirates, February 08—Edition No. 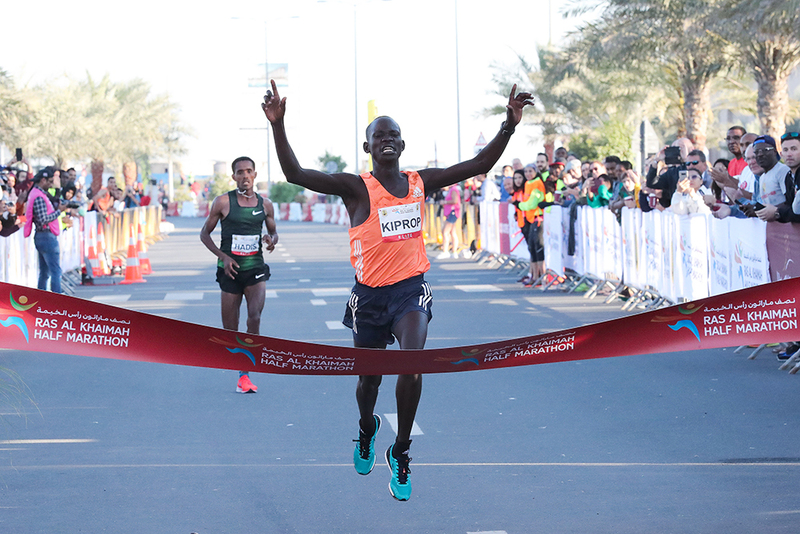 13 of the RAK Half Marathon continued in the tradition of producing fast and deep races with many record-setting performances. Rising Kenyan youngster Stephen Kiprop sprinted past Ethiopian Abadi Hadis in the final 40m to win the men’s race in 58:42, while Senbere Teferi prevailed in an even closer finish as she out-leaned fellow Ethiopians Netsanet Gudeta and Zeineba Yimer to capture the win and a share of the Ethiopian Record in 65:45. Fast times were not limited to the podium finishers as Swiss sensation Julien Wanders finished 4th in the men’s competition in 59:13, trimming 19 seconds off Mo Farah’s European Record. The race also produced historically deep finishes as for the first time 11 men bettered an hour and 6 women ran under 66:15. The women started first and by the time the sun crested the horizon a pack of 6 women and 2 male pacers had swept through 5K in 15:32 and maintained the 3:06K tempo crossing 10K in 31:02 (65:30 pace). The tempo lagged through a subsequent 31:23 segment with Teferi noting, “I wanted the pacers to go faster,” but making her second effort at the distance after collapsing with dehydration after 20K while leading the Delhi Half last October, she was hesitant to push past the pacers. Entering the final kilometer they finally hit high gear with world champ Gudeta and the 20-year-old Yimer trading attacks. Teferi, who produced track PRs of 8:32.49 and 14:23.33 last year, edged ahead at the line to take the win and the Ethiopian record by a mere second, closing the final 400 in 65 seconds. With her DNF in Delhi, Teferi’s finish here ranks as the fastest women’s “debut” ever. The men’s race followed a different script as the pace ratcheted up after an opening 5K of 14:13. A large pack of 15 plus 2 pacers passed 10K in 28:12 and remained together through 14K when Hadis threw down a 2:40 kilo that quickly strung out the pack with only Kiprop able to cover the torrid surge. Hadis—who has run 12:56.27 and 26:57.88 on the track—did his best to shake the 19-year-old Kiprop, zigzagging across the road. Hadis lifted the pace even higher in the final 600 and built a 10m lead only to have Kiprop charge past in the final 50, covering the last 400 in a stunning 56 seconds. “My plan was to wait until the final 200m,” offered Kiprop, who has not raced on the track since he was a schoolboy, but ran off a string of four fast half marathons in ’18. 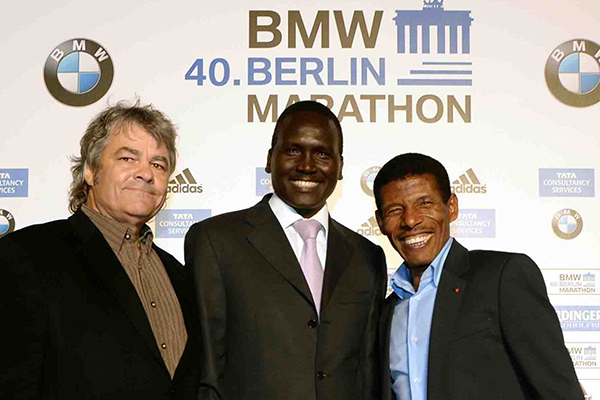 Kiprop equaled Bedan Karoki’s course record and moved to =No. 6 on the all-time list. 3. Fikadu Haftu (Eth) 59:08 PR; 4. Julien Wanders (Swi) 59:13 NR; 5. Morris Munene (Ken) 59:22 PR; 6. Mule Wasihun (Eth) 59:34 PR; 7. Daniel Kipchumba (Ken) 59:36; 8. Amdework Walelegn (Eth) 59:39; 9. Abel Kipchumba (Ken) 59:40; 10. Shadrack Korir (Ken) 59:42 PR; 11. Kaan Kigen Özbilen (Tur) 59:48 NR; 12. Edwin Kiptoo (Ken) 60:20; 13. Lelisa Desisa (Eth) 60:36. 3. Zeineba Yimer (Eth) 65:46 PR; 4. Degitu Azimeraw (Eth) 66:07 PR; 5. Valary Aiyabei (Ken) 66:14 PR; 6. Peres Jepchirchir (Ken) 67:36; 7. Pascalia Kipkoech (Ken) 67:38; 8. Naomi Rotich (Ken) 68:19 PR.